One of my favorite dishes of all time, Coq au Riesling, is absolutely gorgeous. Best of all, it’s one of those dishes that masquerades around, looking all gourmet, when in reality, it’s all smoke and mirrors. See, Coq au Riesling is nothing more than a sautéed chicken with a few onions and mushrooms, a dousing of wine and a touch of cream. There’s nothing here that’s any more complicated than throwing together some same old, tired week-night dish. Simple, though, it’s absolutely scrumptious, and perfect for family or company. It’s a great dish for a new cook, and Coq au Riesling stands as a reminder for an older cook like me, of just how a few simple ingredients practically tossed together, can make you look like a genius! Coq au Riesling, before the cream is added. Seriously, I’d eat it just like this! So here it is, the Coq au Riesling, done in about 20 minutes. There’s a minimum of chopping, no fancy ingredients that you can’t get at the store (unless you’re under 21.) It’s simple enough for every day, but also makes a killer dish for company. Easily stretched, make as many thighs as your family would like, add more mushrooms if you wish. I think it’s a perfect example of Gourmet on a budget! I’d serve this over mashed potatoes, just because I’m a Northerner, or perhaps pureed parsnips, if I’m feeling gourmet. A more classic accompaniment might be a pasta or perhaps a rice. Add a simple green salad and few vegetables (Brussels Sprouts would be lovely) and you’ll have a wonderfully rounded meal. Heat butter and olive oil together in a skillet. Sprinkle chicken, both sides, with salt and pepper. Add chicken, smooth side down and lightly brown, turn and cook for several minutes until some of the juices release and the chicken is partially browned on the bottom side. Remove from the pan and set aside. Add the onions and cook for several minutes, until the juices have thickened and the onions are starting to pick up a hint of color. Add the additional tablespoon of olive oil. Add the mushrooms and cook several minutes until beginning to turn golden, stirring now and then. Add the chicken back to the pan along with any juices. Pour in the wine and allow to come up to a boil. Turn down the heat, cover and simmer for about 8 to 10 minutes until the chicken is cooked through. Turn the chicken over to coat with the sauce and set aside on a platter. Remove the pan from the heat and add the cream or creme fraiche to the pan, stirring it in gently. Taste and add salt and pepper if desired. If the sauce seems to thick, a touch of water may be added to thin it to desired consistency. Pour over chicken, garnish with chopped parsley. Serve as desired, with pasta, rice, or a pureed root vegetable and crusty bread. 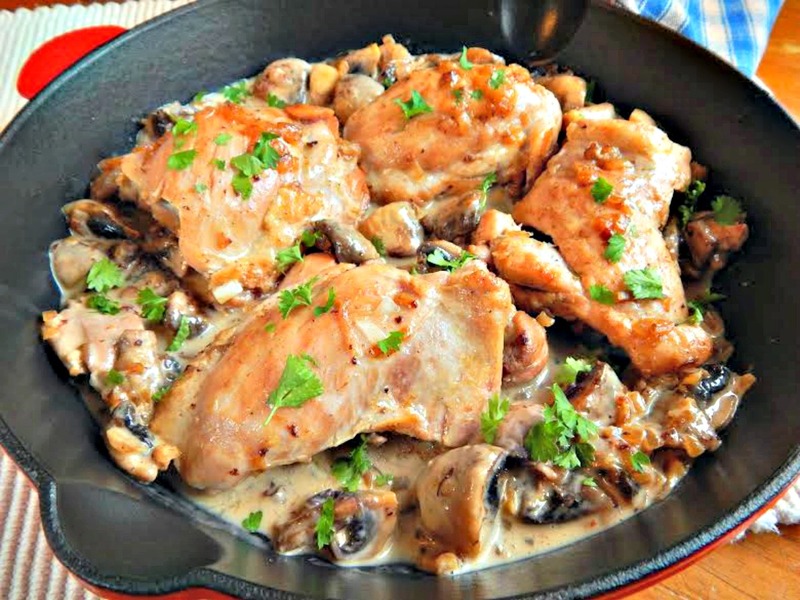 This entry was posted in Click here for Bargain Meals, Click here for Fabulous Food Posts and tagged Bargain Meal of the Week, Chicken, Easy Recipe, French, Frugal Hausfrau, mushrooms, Wine. Bookmark the permalink. The chicken thighs in my fridge will be transformed in this dish tomorrow! Thanks, CCU! 🙂 Cheers to you! Hi Mr. Fitz! It seems sometimes the simplest things are! My mouth is watering! These flavors are some of my favorites. Yum! Are your thighs also skinless? The meat is beautifully golden brown and with the mushrooms in the bottom of the pan truly mouthwatering. Yes, they are, although you could go either way, here. I’m suspicious of some braised dishes with skin because I really don’t like skin unless it’s perfectly crispy. Just a thing.